Off to Edinburgh first thing to discuss all things web with other like-minded individuals at the Scottish Webteams Forum. I’ve managed to get roped into doing a quick session on blog tools so this very site should get a mention. Will be interesting to hear what others think of the approach we’re taking. Being from that neck of the woods myself, and a geographer to boot, I shouldn’t get lost on the way to the City Chambers. However on websites poorly designed navigation often leads to lost and frustrated users. As such this is an area which deserves plenty of attention when it comes to our testing. Interested to get feedback on whether this is an improvement on our current design. 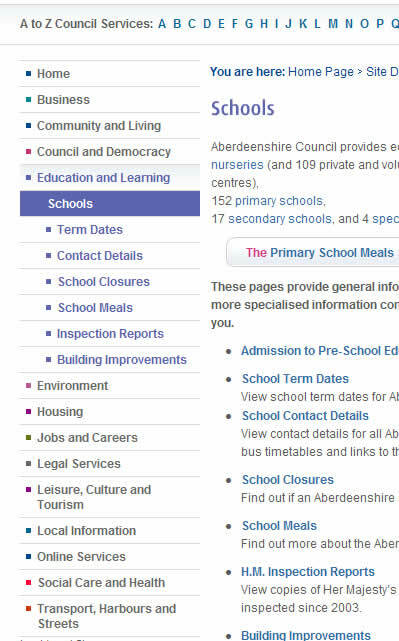 In particular the arguably more subtle use of colour and showing main section links on every page – we remove these at lower levels on the current site.